Digital distractions. Ugh. I dream of the days when I was a kid and I just freely went about my day without worrying about where my phone is or having the ability to look up trivial information rigththissecond. Even when I’m using it, I hate that I’m using it. But it’s hard when everything happens through your phone: people communicating with you, news, work, photos, etc. It just does too much, am I right? It’s so silly. Just have some discipline, right? But unless you try really hard it can easily become your lifeline, your brain and your connection to everything or everyone. I can’t tell you how many times I’ve seriously considered switching to an old school flip phone just to force myself to unplug. But then I think of all the moments I wouldn’t have photos of because I have my phone with me all the time, but chances are I wouldn’t lug a camera around. I need a phone that takes great photos, but doesn’t let me check email, download apps, etc. Who wants to invent that for me? 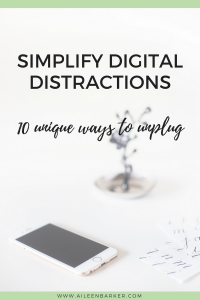 Until I get my dream phone I want to share the different tricks I’ve used to unplug myself from the digital world a little bit. There are tons of these lists out there, but I like to think that some of my methods are a little more unique. I even included some tricks for cutting down computer use so you’re making sure your time on there is productive. Shall we? Note: This post contains affiliate links to products or services I currently or previously used. I may receive a small commission if you buy something using these links, but you don’t have to. One big thing I’ve had to do as a mom is set times that I actually use the computer. This is something I’ve done out of necessity, not something I happened to have the discipline to do. Since I have a 2 year old who wants to type on my computer and/or needs my attention as soon as I open up my laptop, I just keep it in my office and don’t bother when he’s around. Unless my son is asleep or with someone else I don’t get computer time. This drastically reduces the amount of time I spend online. If this special dilemma doesn’t relate to you, find a schedule that makes sense for you. If you have to work on a computer all day at work so you can’t really avoid it, maybe just designate lunch times and an hour after dinner for personal computer time or social media time or whatever it is you need to cut back on. I find the less time I have, the less time I waste because I know the clock is ticking. I don’t get as engrossed and I can check in and out much more quickly. This one is going to sound really ridiculous, but bare with me. For my birthday this year I splurged on an apple watch. How does a device that’s attached to your wrist buzzing every time you get a notification going to help you unplug? Isn’t that worse than a phone? Here’s how it helps me. During the day I just have my apple watch on my wrist to notify me of texts or calls so I don’t constantly have to have my phone by my side. I don’t have many apps on it at all, it’s merely there to act as a way for my loved ones to get ahold of me. In addition to the apple watch, I charge my phone during the day instead of at night when most others do. And I charge it in the bathroom so I’m less likely to do stuff on it on it while it’s charging. Every morning I’ll wake up, throw on my watch, plug my phone in and have a good half day where I’m not distracted with my phone at all. This in combination with the apple watch has kind of changed my life. I know it’s silly, but it’s true. I no longer carry my phone around the house and get distracted by it all day. Put all of your apps in folders. The only thing I like to have on the home screen on my iPhone is the camera, messages, phone app and Waze. Everything else is in a folder so I’m less likely to see Instagram (or whatever other app) and click on it. Here’s the thing about apps. You can download them again so don’t be hesitant to delete them if they’re distracting you. I haven’t had the Facebook app for probably a year. I almost always delete game apps within a few days of downloading them. Make it just a little harder for that distraction to creep back in. This is less something that will actively, in the moment, help you stop wasting time and more something that will give you an overview of how you spend your time on the computer. You can set certain websites and applications as productive or unproductive. At the end of the week you can see a report on how productive you are and how much time you spend on the computer (probably way more than you think!). Back when I was childless and doing design work I would get reports saying I had been active on the computer for 50+ hours a week. That’s always a nice little wake up call. These days it’s more in the 20-30 hour range and I’d like to reduce that even more by simply being more productive and limiting time wasting activities. Check out RescueTime here. You can download a browser extension that will shame you for trying to go to websites you’ve blocked or only allowed a certain amount of time for. I currently use Stayfocusd and it’s a lot more advanced than Leechblock which I have also used and like. I will usually will set 30 minutes for social media per day and after that the websites get blocked. I have to type up a long, confusing, paragraph with no mistakes before I can access settings after the time is up. It sounds intense, but I don’t even try to override them. It’s there to remind me that I set a limit and I’m sticking to it. You can get Stayfocusd for Chrome or Leechblock for Firefox. I’ve done this with Facebook several times and even one of my Instagram accounts once when I found myself checking them without even thinking about it. It’s so nice to kind of reset that obsession. Your account will still be there when you go to log in, but sometimes knowing that you’ve deactivated and there’s nothing waiting for you helps. I find that Facebook clouds my mind. So many status updates that honestly don’t matter to my life. So many videos that aren’t really enhancing my life in any way. When I do deactivate I usually commit to at least a few weeks. The people in my life who truly mean something to me keep in contact with me without Facebook so reading about my 3rd grade acquaintance’s new job isn’t really a priority to me. If you’re terrible like me (hey, at least I admit it!) sometimes you like to have a back up roadblock. In addition to deactivating, I’ll often change my password to something crazy and then put it in a post it note and hide it somewhere in my house. Obviously I know where it is, but it makes it hard to just log in when I’m bored waiting in line at the grocery store or even when I’m sitting at my desk it makes me think twice. This is an obvious one, but I wanted to mention it for anyone who hasn’t already done this! I don’t have notifications on for anything except text messages and eBay (which is my business). I have my mail set to manual push mode where it doesn’t load my emails unless I check the app. This way my phone isn’t constantly dinging at me all day. I swear one notification can easily lead to a wasted 30 minutes. I know these sound extreme and some of you are like “wow, have some self control lady”, but just do what works for you. I don’t use all of these methods at the same time, I switch around as needed. I go through periods where I just need a big break and to step back and when I do that I always feel 100 times better without the extra noise in my head from social media and spending too much time consuming thousands of pieces of information from a screen each day. Do you feel like you need to unplug or do you find that you don’t have any issues with being “too” connected?